Personally, the coolest thing going on tonight is the Lantern Festival at Forest Hills Cemetery. You may not feel like going to JP, so there's other stuff to do. 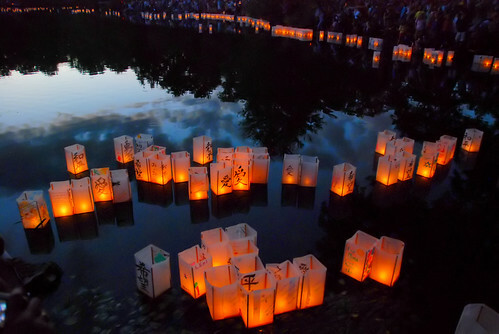 This is based on the Japanese midsummer Bon Festival, a Buddhist ritual in memory of loved ones in which lanterns represent the souls of the dead are floated out to sea and prayers are offered so that they might rest in peace. You can write some thoughts about your departed on the shades of the lantern, then watch it float about Lake Hibiscus. Flickr is full of beautiful scenes from previous years. From 6pm to 8pm, the evening starts with performances from gospel singer Ron Murphy, the Samurai drummers of Tsuji Daiko, and dance performances from the Chu Ling Dance Academy & Showa Boston Institute. If you don't have anything to say to the dead, you can sit back and enjoy the proceedings without giving a penny (but you could)... It's okay to bring picnic. A flashlight is suggested (but you'd be okay without one). It's 'Shark Night' at HMNH, but you gotta be cool while still enjoying yourself. The galleries (glass flowers, glass sea creatures, stuff that isn't glass) are open for 3 hours at 50% off regular admission. At 7pm, there's a screening of this documentary about great white sharks off of Isla Guadalupe, Baja that "explores many of the issues surrounding these highly misunderstood animals, the efforts of dedicated shark researchers to study and protect them, and the unique cooperative relationship that exists between the researchers and eco-tourism operations." John Mandelman, the shark maven at New England Aquarium will lead a discussion afterwards. Maybe fewer people will know about the dress rehearsals? They had an open rehearsal last night, so I doubt there will be any major gaffes. (I doubt you'll even notice. haha.) The annual Free Shakespeare performances are really one of the best gifts to the city, so we should appreciate it and take in a performance. It's one of the Bard's sylvan love stories, which the Commonwealth Shakespeare Company will twist it in their way as they usually do each year. It looks like the sets might be reinterpreted in a 1930's/40's style. Dennis Brennan and his band have just begun a Thursday residency that will last 'til the end of August. If you don't know about this stunningly good rocker-songwriter, you better get knowledgable as soon as possible! He is a musical treasure that also surrounds himself with killer players. This might be a little too avant/noise-y for some, but it's a solid lineup of pushin' the rock envelope. Forget about what notes you think you should hear -- get into the cool things you are hearing and the way it makes you think/feel/move (in whatever order you like). Neptune is just a spectacle besides the music with their extremely cool, homemade instruments; and they will splatter the crowd with a special arty-funky groove. Ho-Ag is my fave of the four; I love their edgy thang with enough hook 'n riff 'n rave to snag a trad-guy like myself. It's hard to say what Summerduck will sound like; I heard the demos on their site are a year old, but it's led by the former bass player from Night Rally -- if you liked them... I like the name "Bone Zone", and they play hard & fast with a post-punk twist.